Our Baby Footprints personalized dog tag pendant makes a great gift for Dads, Grandpas, Uncles, and Siblings. 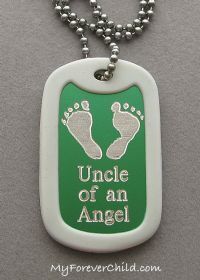 Our signature baby feet image is engraved into a large colored aluminum dog tag. Made from high quality anodized aluminum in a variety of colors. Click the links below to view the color combinations available. This listing is for 1 personalized dog tag. Makes a great personalized and affordable keepsake for children, teens, and adults. 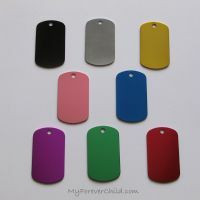 Select one of the attachments below to turn this dog tag into a pendant, keychain, or bag tag. Dog Tag measures approx. 2" long x 1 1/8" wide x 1/16" thick. Our optional rubber silencer in coordinating colors are perfect for a finished look, select color below.